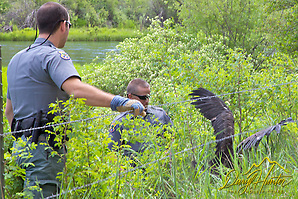 Game and Fish officers Shane Liss and Brain Jack herding eagle to safe capture position. On Thursday, June 13, I was diligently working away on my book when the phone rang, I answer and it is my photographer buddy Bill Drake. Well Bill explained that he is with a golden eagle that can’t fly and not being far from my home in Swan Valley Idaho, he asked whether I knew the local Game and Fish people so we could rescue this eagle. I told Bill we could do something, I just wasn’t sure what yet. Shane Liss the Swan Valley Game and Fish officer lives a few doors down so I went over and asked whether they could do something and Shane said he could but needed to wait for assistance. I told Shane I’d be down with Bill and the eagle and made sure Shane had my cell number. I rendezvoused with Bill and took a few photos of the hapless eagle. When Bill had arrived it had been hanging out in the middle of a dirt road that abutted the South Fork of the Snake River, not a good place for an apparently flightless eagle. We then waited for Game and Fish to arrive; we didn’t want to pressure the eagle. While wiling away the time Bill and I had been watching a Bald Eagle across the river watching us. Bill and I were soon deep into swapping lies and wildlife photographer shoptalk, when the bald eagle circled over us then hovered for a second twenty yards above our heads, as they do when they spot a fish. Bill and I grabbed our cameras for a quick “on the wing shot. The bald eagle upon our commotion flew off. Officer Liss soon showed up with Officer Brain Jack, and we discussed the situation. With a plan formulated Shane and Brian dropped down the riverbank to drive the eagle to the west side of the road where there was a steep bank. 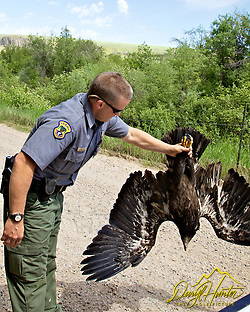 After a bit of herding and wrangling the young eagle was soon safely in the grasp of Officer Jack. Officer Liss, speculated this was an unfortunate juvenile who lost the hierarchy battle with a sibling and was kicked out of the nest, a seemingly cruel reality of birds of prey. When adult raptors can’t provide enough food, the stronger chicks will deprive weaker chicks of food. 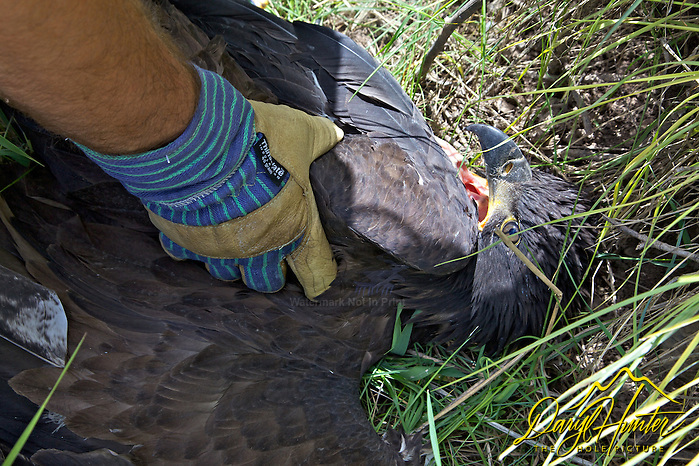 After the eagle was secured and safe and on its way to a raptor rehab center Bill went along on our way. Bill went searching for a king fisher nest, I went home, and processed my photos then wrote a blog post of the unique experience and posted it. After publishing the blog article I had a nagging feeling that I didn’t have the story right. 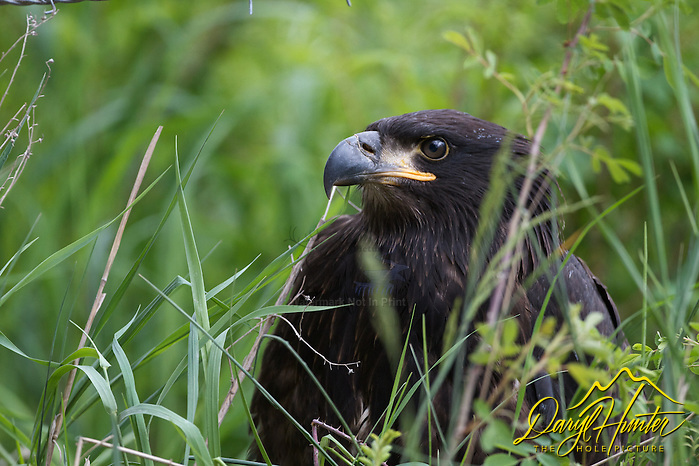 The assumed golden was in bald eagle territory and although the two types of eagles’ territories overlap, where I usually see golden eagles hunting is in meadows and valleys and bald eagles at the rivers, we were next to a river full of bald eagle food. 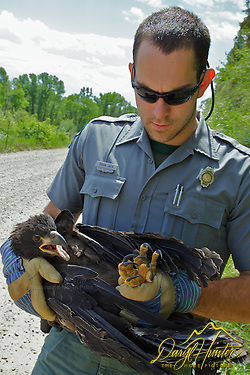 I later phoned Officer Jack and asked what were the chances that this was a bald eagle chick instead of a golden, evidently the Game and Fish officers had been pondering the same question. After Bill and I left they reinspected the bird more scrupulously and had determined it was a bald eagle chick and not a golden, so they chose a different course of action. The adult bald was not, as assumed, a predator, it was a concerned parent and a bunch of do-gooders intervened in the midst of some flying lessons that weren’t going so well with a seemingly reluctant student. Office Jack and Officer Liss instead of taking this young eagle to the raptor center decided to take him up on the hill to a higher vantage point, away from the road, river, and do-gooders, where its concerned parent could have another go at coaxing the youngster into the sky. On the hill above he was out of the danger of the road and away from the uncertainty of outcome had it been spooked into the fast moving river. This lucky juvenile had the good fortune (we hope) of having Bill come along and set in motion a rescue plan that removed the chic from a seemingly perilous spot to another with more promise. 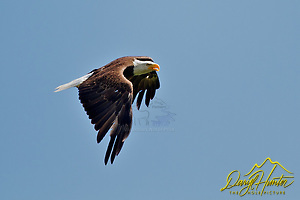 I hope that today this chic has found the magic in his wings and is soaring above the South Fork hunting for trout. 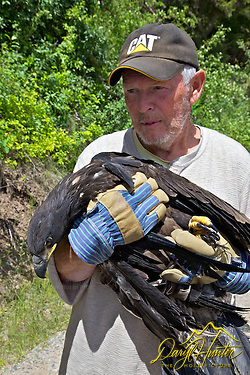 This is a rewrite of a previous post where I had assumed this was a golden eagle rescue. Several astute readers had deduced this was a bald eagle chic before I had time to rewrite the article, and I thank them for their contribution, I apologize for not rewrite the blog as soon as I found out, but I had already been borrowing time from elsewhere. Whether I was a rescuer of an imperiled bird or meddlesome misguided do-gooder interfering in the process of nature, this was an experience I will not soon forget! 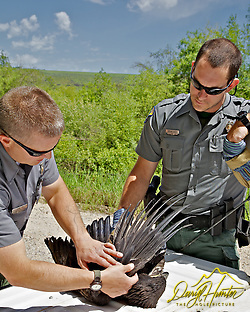 Officer Liss calms eagle before putting it in holding cage. Posted on Thursday, June 13th, 2013 at 3:59 pm. Filed under: Blog, Wildlife Tags: bald eagle rescue, Bill Drake, birds of prey, Brian Jack, endangered species, fledgling, game and fish, Idaho, raptors, Rescue, Shane Liss, Swan Valley	RSS 2.0 feed. Thanks Daryl for this story. It was a good day indeed! Thank you for all your efforts in this rescue! Very remarkable story and photographic journey. I hope we get to hear more of this birds recovery and re-entry into the wild. Great story and photos Daryl! So glad to hear the eagle will be rehabilitated at the Raptor Center and will get a second chance thanks to the caring efforts of all involved! I really enjoyed reading about this wonderful rescue. My cousin, Ben Spann, posted it on his fb page so thats how I was lucky enough to read it. I have always loved reading about eagles. I live in Northport, Al which is in Tuscaloosa County. I hope one day to get to see a eagle other than in pictures and on tv. Eagles are one of the most beautiful birds ever!! Thank you for helping to rescue this one. What a great way to end a trip Bill. Daryl thanks for chronicaling the event. I appreciate the efforts to save this Eagle, and the commitment to protect the wildlife that is so much a part of our lives in the area’s we live and the photography obsession we enjoy. Great story with a happy ending……nicely written up, Daryl! i was thinking same thing, this is probably fledgling bald eagle and that adult bald wasn’t looking for lunch but was concerned about its offspring. would love follow up to this story. Yes, that turned out to be the case. Thanks Rosana, yes that is what I found out latter, sorry it took so long to amend the article. but awesome rescue – thank you, guys! As it turned out, you are correct. Are you sure it was a golden eagle? Looks the same as a juvenile bald (to me). Maybe the other BE was its parent? Wondered if you noticed injuries? Anyway, thanks for everything you do for wildlife. has anyone seen this juvie? I’m sure someone has gone out to see if its in the same place or has moved on. Great job. thank you.